Lidia Bastianich of PBS' Italy in America and Andrew Zimmern of the Travel Channel's Bizarre Foods are two of the celebrity television food stars who recently have made Salumeria Italiana part of their shows. Both loved the store, marveled at delicious tastes of cheese, such as Moliterno al Tartufo, and meats, such as Hot Capocollo, and shopped for pastas, colatura (anchovy essence), and other hard to find Italian products. Above owner Gaetano Martignetti meets Andrew. (Gaetano's aunt Tetta also had a cameo role, her TV debut at age 98!!!). The staff was proud to show off the great products and services of the store -- and we love watching it on TV. Catch the shows in reruns!!! Bloggers have become a force in the food world, and we embrace the enthusiasm and DIY spirit that so many put into explorations of food and cooking. Recently Salumeria Italiana greeted nine area food bloggers who toured the North End, under the sponsorship of Bertolli. With Chef Raymond guiding them, the nine heard about the history of the store, and tasted delicious imported Italy cheeses and meats. Raymond told them all about extra virgin olive oil, giving a virtual regional tour of Italy as he did. And the tasting finished with a round of tiny spoons -- Rubio, our exquisite aged balsamico, what Raymond calls "love on a spoon." They all fell under the spell! Of course, what bloggers do best is write about their experiences, so read on to hear why Salumeria -- and Rubio -- won their foodie hearts. 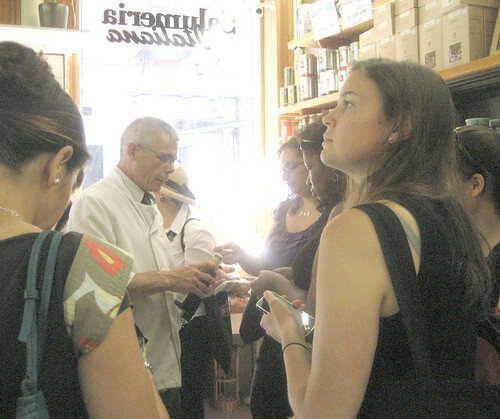 Professor Merry White's Food Anthropology class recently came into the store to learn about Italian foods. Chef Raymond told them about extra virgin olive oils, why it's worth buying artisanal pasta, and how to select cheeses. And tasting cheeses, meats, and olive oils made learning delicious. We’re in the news, and we want you to know about it. Delta Sky Magazine and Andrew Zimmern, TV star of the Travel Channel, focused on Salumeria Italiana in February issue. 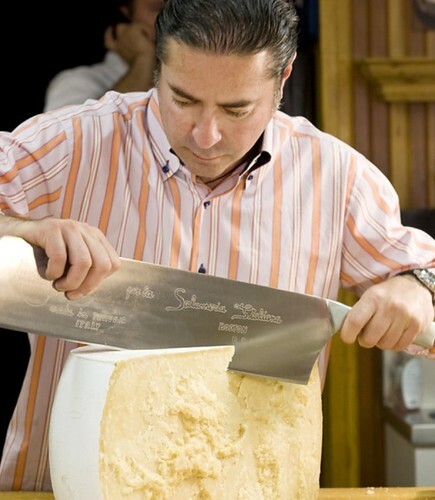 One of the photos features owner Gaetano Martignetti cutting into a big wedge of cheese. Owner Gaetano Martignetti explains putting together an antipasto platter in The Boston Globe Food Section, Sept. 9, 2009. A meal of antipasto must include lots of different cured meats. “The meat is the star,’’ says Gaetano (Guy) Martignetti, owner of Salumeria Italiana in the North End.